bility for the crop. Cranberry bogs were noted in neighboring South Carver and North Rochester during the late 1870s, though it seems that it was another fifteen years before bogs were established at South Middleborough when there is a record of a force picking at South Middleborough in 1893. Certainly Nathaniel Shurtleff had bogs at nearby France (the area of Middleborough situated along France Street) contemporary with or predating those at South Middleborough; he was harvesting from them in the fall of 1897. One of the earliest bogs in South Middleborough was that of Frank Short who purchased two adjoining tracts of land totaling forty-seven acres in 1894 and 1898 from John S. and John L. Benson, respectively located on the south side of Wareham Street at Houdlett’s Corner (the intersection of Wareham and Pine Streets). The latter twenty-five acre parcel of swampland was subsequently drained by Short and transformed into a cranberry bog. At the time, though there were few bogs at South Middleborough, the community was active in the annual harvest. “The cranberry season will soon be here, and we hear of some of our neighbors who will move to the bog with their families to stop during the busy season”, noted the Middleboro Gazette’s South Middleborough correspondent in September, 1895. Ultimately, over 20 South Middleborough residents would engage in that fall’s harvest, as pickers, as screeners, and as overseers. That same year, 21-year-old Boston University student Jennie Gammons, daughter of Ephraim H. Gammons of South Middleborough, who would later become a noted local correspondent and in the mid-20th century one of the oldest active newspaperwomen in the country, wrote the following evocative description of the cranberry harvest as known to South Middleborough pickers. At this season of the year the cranberry industry is at its height and there is many a picturesque scene on the flat, low-lying meadow land, intersected by ditches, and surrounded by hilly woodland, rising higher and higher in the distance with its tall trees, blackened once by forest fires. A bit of dry, withered foliage is seen at the tops of the trees, and below, the bare, brownish trunk with a few leafless branches. All this serves as a foundation to the changing and lively picture which the cranberry bog presents to-day. Just on the slightly raised edge is a roughly built screen house with no ornamentation, save a square many-paned window and a steep, back stairway, leading to a tiny doorway somewhere near the roof. Down on the meadow, a motley crowd teeming with energy, men clad in patched, half worn unmentionables and neglige [sic] sweaters; women in fantastic attire, and crowned with immense sun hats; children with burned, freckled face, some times tear stained; infants are there, too, some seeming to enjoy the situation, while others are holding their mouths in position for a loud cry. 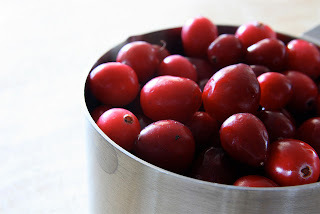 Through all this there is a gleam of the six-quart tin pail, marked off with ridges, and known as the cranberry measure. Down on the ground amid the green net-work of vines are the masses of deep red berried, oval in shape and slightly pointed at the end, and right here are the pickers with heads bent over, fingers flying, keeping time to the thump, thump, made by the berries falling into the empty pail, which, by means of handful after handful fills up at last. Occasional shouts of laughter and loud voices are mingled with the hurried click, click of the scoopers, which compelled by human power, ply through the vines and quickly pull away the fruit. Section after section is lined out, crawled over, trampled down, and the contents carried away in medium sized barrels. The only resting time is at the noontide hour, and the dinner pail takes the place of the cranberry measure and the lunch, consisting of sandwiches, a good supply of pastry with a bit of fruit, as dessert, would seem a royal meal, but for the wasps, which come, uninvited, for their share of sweetmeats. In spite of the mid-day heat the laborers, with renewed vigor, begin the afternoon’s work, which wears away, and, as the sun sinks lower the shadows appear, while now and then a cool breeze fans the hot faces and brings fresh zeal, so that the very busiest time is toward nightfall. The more deft of the pickers “head down” the delinquent, lagging ones and the whole crowd comes together with a hurried scrambling and scrabbling, lest the sly ones skip away and leave behind a bountiful supply of underberries, visible through the torn away vines. The sudden shout “Knock off’ re-echoes over the meadow and ends the daily toil. Then follows a scattering hither and thither, but the continued cramped position has rendered the limbs stiff, and almost all carry themselves in an ungraceful manner. While on the homeward way, the tired look of the faces gradually changes to a more serene expression and the eyes, blinded by the hot sun together with the steady downward gaze, become brighter, and the empty pails, swinging on their arms, as they go, bring that sense of relief which comes only when a day’s labor is finished. The harvest of dimes piles up into dollars, others making the necessary wherewithal for winter use, and compensates for the discomfort caused by the torn, sore fingers, aching limbs and weary bodies. Middleboro Gazette, "South Middleboro", August 23, 1895, page 1; ibid., September 13, 1895, page 1; and "Cranberrying", October 4, 1895, page 1.